Back in 2003, Freddy vs. Jason finally hit theaters and fans turned out in droves to see it. Ronny Yu’s merging of two classic slasher icons in one battle royale film resonated with fans (who’d waited years for it to actually happen) and talk about a sequel started almost immediately. Like all good horror sequels, Freddy vs. Jason 2 couldn’t just be a rematch – it had to have a new titan added to the mix, and the fans clamored for a variety of horror’s heavyweights: Michael Myers, Pinhead -- heck, I even remember someone only half-jokingly suggest the Leprechaun. However, as time wore on, one name became more popular than all the others: Ash. The star of Evil Dead made perfect sense to serve as a new addition to this side story – Ash was actually a good guy (something the first film lacked) and he had proven more than capable of holding his own with supernatural menaces in Raimi’s three Evil Dead films. Best of all, Bruce Campbell was down to do it. 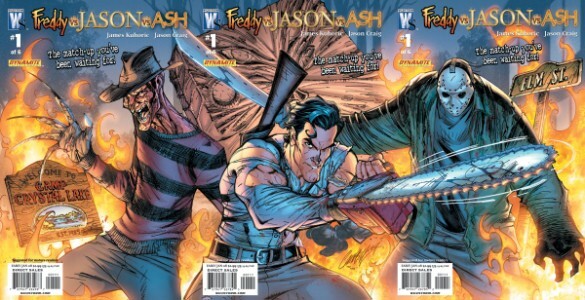 Like the original Freddy vs. Jason, fans are still waiting for this magical mash-up to happen years later. The closest we’ve come is a Freddy vs. Jason vs. Ash comic miniseries from a few years back, but as Robert Englund (aka the real Freddy Krueger) recently told attendees at the Nashville Comic Expo, the film came really close to becoming a reality. Sounds like they had the tone about right (adding Ash to the mix was bound to up the comedy quotient of the series), and it’s unfortunate that it never came to pass. We’ll probably see more of Ash in upcoming Evil Dead films (there are hints that he might turn up in a sequel to the remake and Raimi is still mulling over a new main entry as well), and Jason is reportedly returning sometime in the not-too-distant future. Freddy, meanwhile, appears in limbo for the time being. Maybe they should make this movie just so Robert Englund can get back into the makeup. That being said, as awesome as this crossover sounds, I’d still prefer seeing Ash team up with Phantasm’s Reggie Bannister in a crossover where they take on the Tall Man and the Deadites. That would be all kinds of awesome.